Longan | Molina & Sons (PHILS.) 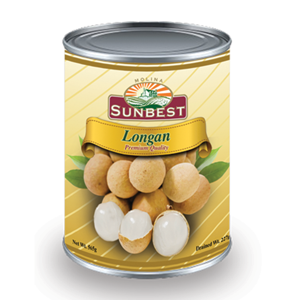 Inc.
Sunbest Lychee is made of quality lychee fruits which was carefully processed and preserved in can. It has a whitish pulp and a fragrant, sweet taste. It is often serve as it is and is also used for variety of desserts. Longan is rich in glucose, sucrose, protein, fatty acids and spleen. It tones the blood and prevents hair loss.